As we all know, or should by now, the key to maintaining great oral health is keeping up with a daily plan of flossing, brushing, and using mouthwash. These three practices in combination will help you avoid tooth decay and keep bacterial infections at bay. At Laredo Dental Care, we’ve noticed that it’s usually not the toothbrush or floss that people have trouble picking, but the mouthwash. 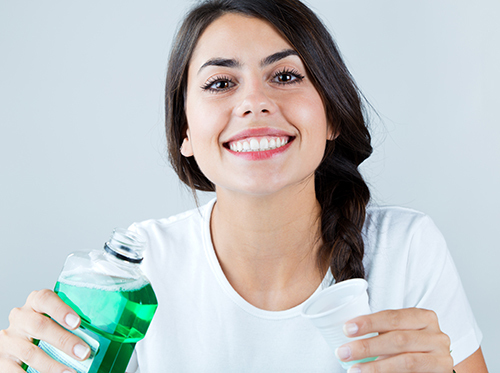 Depending on the ingredients, different mouthwashes will have different effects on your oral health. Here are some ideas to take under consideration when you’re trying to decide which type of mouthwash will best fit your needs. If gum health is your concern, antiseptic mouthwashes are designed to reduce bacteria near the gum line. If you drink a lot of bottled water, you may want to consider a fluoride rinse to make sure your teeth develop the level of strength they need. Generally, any mouthwash will combat bad breath, but some are especially designed to do so. Opt for products that are ADA approved, to ensure you aren’t exposing your teeth to harmful chemicals. If you experience an uncomfortable, burning sensation when you use a wash, stop it and try another! Still have questions about mouthwash? Feel free to ask Dr. Jose Gonzalez Jr, DDS during your next visit to our Laredo, TX office! We’re always happy to answer your questions. Happy rinsing!